Fro99ywo99y1 explains how he has mastered SRL! How did you get started in Destiny? What do you do when you’re not setting world records in SRL? I’ve always been a fan of the Halo games and thought I’d give Bungie’s new game a try. Little did I know it would quickly become one of my favorite games of all time. I’m currently a college freshmen looking to major in computer science so life can get busy at times, but luckily SRL lined up perfectly with my winter break. The GameCube version of Mario Kart was my first video game ever and really started my love for racing games in general. I also have a hobby where I try to solve Rubik’s cubes as fast as possible, so this combined with my racing experience fit together perfectly in SRL. Let’s talk about your SRL methodology: What’s your preferred Sparrow? How do you top the leaderboards? If the overdrive on the raid sparrows is used enough, it ends up being much faster than trick sparrows, so I prefer to use them. I specifically use the XV0 “Timebreaker”, but the S-13 “Graverobber” works just as well. This year in SRL it seems that Bungie made some changes to how the raid sparrows work. The destruction overdrive (which happens if you hold the overdrive for too long) is about twice as fast as it was last year, and can be used to make up a lot of ground as you approach the finish line. Sadly, a glitch was created that causes the raid sparrows to sometimes randomly explode. As for some general tips, I would recommend learning the maps and practicing with trick sparrows before making the switch to the raid sparrows. The raid sparrows have much worse handling and are very punishing if you miss a gate because of their inability to do tricks to regain boost. If you are looking to try out the raid sparrows, then you’ll want to make sure you’re pushing the overdrive to its limit throughout the whole race to get the maximum benefit. I typically use the overdrive in between gates and let it rest as I go through them. When taking a turn, try and position your camera in the direction you want to go and side boost through gates to maintain top speed. 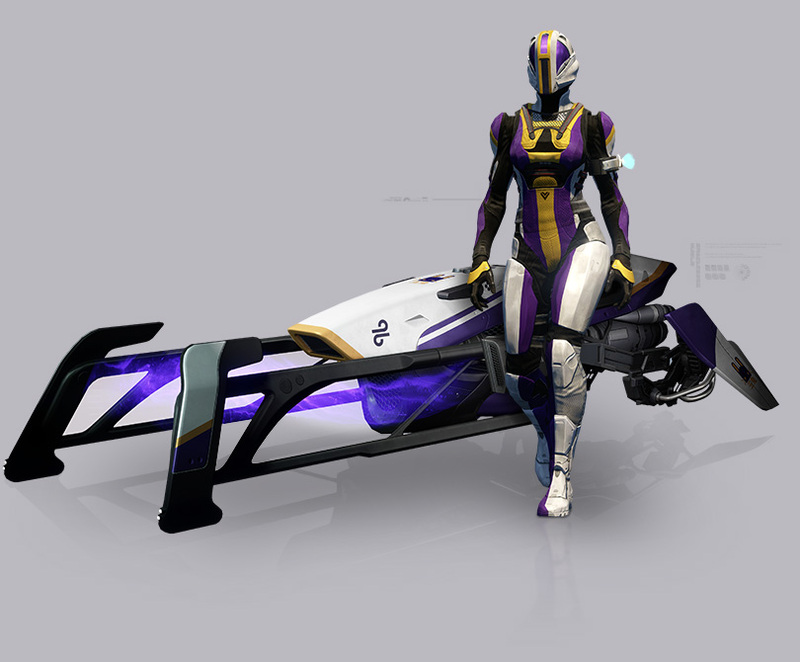 Also, you’re going to want to use the full racing gear, especially the helmet with the air control perk. Your SRL times are one thing, but you also won a Sparrow wrecking balls contest in Trials – tell us about that. That was a fun little event where the challenge was to see if you could get two wrecking balls while only using your sparrow. I just figured since I was so good at hitting gates in SRL, maybe I’d try my luck on hitting a few guardians in Trials. I ended up searching through the casual Trials section on LFG and found some guardians wanting to farm for passage coins. It took about 8 hours to get both wrecking balls and a lot of luck. I just kept trying to bait the other team into the building on First Light and eventually it worked out. Bringing our focus back to SRL, let’s talk about each map. Campus Martius (4m 2.684s): The Mars track is full of twists, turns, and obstacles, and has a well known shortcut. You finished 2nd in the world here last year, and have bested that time by 4 seconds already this year. What are your best tips for finishing first on the red planet? Towards the beginning of the track there is a split in the paths, you can either go over or under. If you hit the gates properly, the under path ends up being faster. Then comes the downward spiral turn. You’ll want to have at least three side boosts to take this on properly. Cut along the left wall and position your camera with each side boost. I see a lot of people having trouble clearing the gap after the man cannon on mars while using the air control helmet. If you enter the center of the man cannon and pull back slightly as you go through it, you should be able clear the gap with ease. The fans can be tricky. Instead of focusing on which fan blade you should avoid, try focusing on the open spaces in between the fans to try and position yourself so you can slide through them. The reason I have been able to beat last years time on this map by such a large margin is by using a trick that I believe was discovered by Epicookiez over on Playstation. He found that if you use the destruction overdrive to blow yourself up as you enter the man cannon, it will spawn you right in front of the gate before the fans. This saves about a second per lap if you can time it correctly. Haakon Precipice (3m 57.689s): The Earth track takes us on a slalom course up and down the side of the Felwinter Peak. Do you have any advice for Guardians troubled by rotating satellite installations, the woods near the end, or that [email protected]$&ing forklift? In the beginning, cut the turns as close to the wall as possible and make sure you are using the air control helmet after the large jumps to get to the ground as fast as possible. There’s two places where the paths split left and right. I use the left paths. For the rotating pillars, I try to determine where the they are going to be based on how far away I am from them. You’ll sometimes be forced to slow down in order to hit the gates, but with the raid sparrows you can use the overdrive to speed up if you see that a pillar is about to get in your path. That forklift can be avoided if you angle the camera correctly and side boost through the gate before it. And for the trees, just keep your sparrow in a straight path. Infinite Descent (3m 48.229s): Venus is a location you conquered last year, and you’ve improved on that time this year. This track is my personal favorite because it’s the only one without obstacles blocking gates and it also has the most potential for the raid sparrows because of the long straightaways. After the first few turns there is a split in paths where you can go either left or right. The right path ends up being faster in this situation because it eventually crosses over to the left and lines up with the next gate outside the cave. After this is the waterfall drop where you’ll want to use the air control helmet to get to the ground and pull back right before you hit the ground to prevent taking fall damage. The ‘shortcut’ on this map where you would go left through a hole in the wall instead of taking the S curve ends up being slower because you skip a gate. Right after the S curve you’ll hit a ramp where you’ll want to pull back to stay in the air long enough to be able to clear another bump in the road that would slow you down otherwise. It turns out that because Bungie buffed the speed of the destruction overdrive, on the third lap it’s about a second faster to skip the last gate and instead begin the destruction overdrive right before the second to last gate and hug the wall while side boosting to the left into the finish line. Shining Sands (4m 9.796s): With massive jumps, teleporters, and obstacle-strewn half-pipes, is this a course where you favor the trick sparrows? This track is the hardest to effectively use the raid sparrows on, however they do end up slightly beating out the trick sparrows. At the start of the track is an upward spiral with a sharp right turn. You want to try and stick to the right edge of the curve while slowly turning your camera as you go up. Then turn the camera all the way right and side boost to line yourself up for the next gates. After this is a split in paths where you can either go to the right around a pillar or cut left through a ramp along the wall. Cutting left creates a straight path for the next gate and is much faster than going around on the right. After this is the halfpipe and the rotating panels. Because they are directly behind the gates, you are sometimes forced to either skip the gate or slow down to hit it. Next is the large half circle that connects to the other halfpipe. If you are using raid sparrows, you want to try and conserve your side boosts as much as possible in this section because you are going to need them later to cut the corners near the man cannons. The trick sparrows can be more lenient here and can use side boosts to avoid the columns along the half circle. After the second halfpipe is another sharp turn: raid sparrows need to take this turn using only one side boost. For the split in paths, I usually just take the right path because that’s the one I’m typically lined up for coming out of the turn. After you get launched out of the last man cannon you want to pull back enough so that you land on the downhill slope instead of the top of the hill. This will help stop you from bouncing around and missing the gate towards the bottom. If you are using the raid sparrows then at the start of each race you’re going to want to try your best to get ahead of the pack as fast as possible to prevent getting bumped around and pushed off course. The ending can make or break your race. Timing of the destruction overdrive should start early enough so that it explodes right when you pass the finish line. To keep yourself from accidentally holding the overdrive for too long, listen for the beeps that happen after you’ve held it for a while. If you hear one or two beeps then you need to let off. Do you see a competitive future for the game mode in tournaments and leagues, or will it remain a novelty in the Destiny universe? The competitive future for SRL is uncertain because of the random explosion glitch. Me and some of the top racers who use raid sparrows have noticed that there will be seemingly random moments where the raid sparrows will be destroyed even though they have not entered the destruction overdrive sequence.